Q: State Councilor and Foreign Minister Wang Yi is expected to give a speech at the UN later today. Could you give us some information about that? Is he expected to talk about the recent tensions between China and the US, especially in the context of US leader's accusations of China's meddling in the US mid-term elections and the trade war? 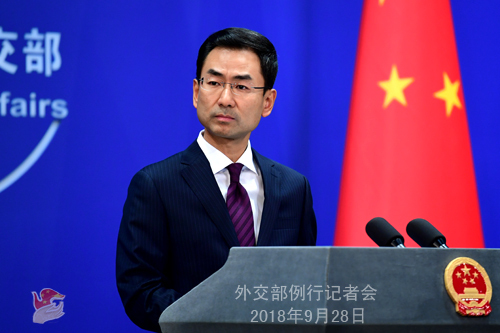 A: According to my information, State Councilor and Foreign Minister Wang Yi will deliver a speech at the General Debate of the UN General Assembly tonight Beijng Time. Please stay tuned then if you are interested in it. Q: What does China think of the US planning to make a counteroffer to an Exim-funded Internet network in Papua New Guinea, potentially thwarting Huawei's ambitions in the Pacific Islands countries? Will China offer other incentives to Papua New Guinea in response? A: I am not aware of the specific situation you mentioned. I can check on that. What I can tell you here is that the Chinese side attaches great importance to developing the strategic partnership with Papua New Guinea. For a long time, on the basis of fully respecting the will of the government and people of Papua New Guinea, China has been offering assistance to Papua New Guinea as its capacity allows and if I may point out, with no political strings attached, and actively conducting mutually beneficial cooperation with Papua New Guinea. This has effectively promoted the socioeconomic development there and been warmly welcomed by the government and people of Papua New Guinea. We are also willing to work with all relevant parties to continue to contribute to the development and prosperity of Papua New Guinea. 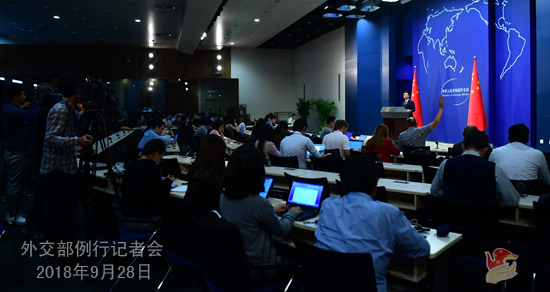 Q: On September 25, the first session of China-Japan Third Party Market Cooperation Working Mechanism was held in Beijing. The press release issued by China's Commerce Ministry made no mention of the Belt and Road Initiative. Did the topics of this meeting cover the Belt and Road Initiative? A: As you mentioned, it was the Commerce Ministry that issued the readout, so I would like to refer you to the Commerce Ministry for relevant questions. According to this year's holiday arrangement during the National Day, there will be no regular press conference from October 1 to 7. The press conference will be resumed on October 8 (Monday). During the recess, the spokesperson's office of the Foreign Ministry will take your questions via telephone, e-mail and fax.